In Gabon, a group of African natives known as the Fang people tell of an animal called N’yamala, identifying it with a picture of Diplodocus. In 1913, Capt. Von Stein was sent by the German government to explore the Cameroon. Von Stein wrote of an animal sized between a hippopotamus and an elephant with a long and very flexible neck and a long muscular tail like that of an alligator. Von Stein was even shown a path said to have been made by this animal in order to get at its food. On p. 257 of his 1927 book Trader Horn, Alfred Aloysius Smith wrote, “Aye, and behind the Cameroons there’s things living we know nothing about. I could ‘a’ made books about many things. The Jago-Nini they say is still in the swamps and rivers. Giant diver it means. Comes out of the water and devours people. Old men’ll tell you what their grandfathers saw, but they still believe it’s there. Same as the Amali I’ve always taken it to be. I’ve seen the Amali’s footprint. 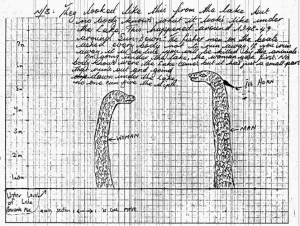 About the size of a good frying pan in circumference and three claws instead o’ five.” In 1948 a group visiting Lake Barombi Mbo in western Cameroon also had an encounter with some long-necked creatures. Note the illustration (above center) drawn by one of the witnesses, A.S. Arrey. It shows what appears to be a female and a male, who sports a horn or frill on his neck. 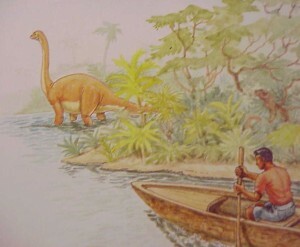 The drawing to the top right, shown in Claws, Jaws, and Dinosaurs, illustrates the monstrous creature as a Scottish explorer reported seeing it in 1932, while canoeing on the Cross River in Cameroon. 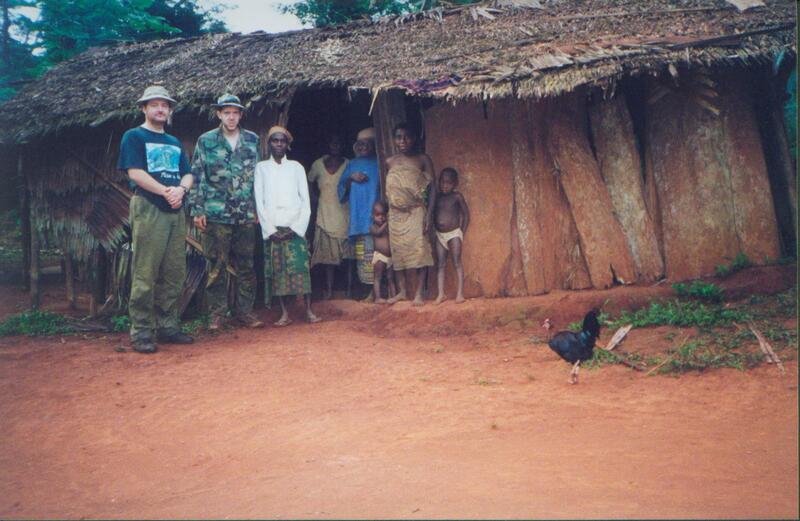 In the fall of 2000 an expedition led by Genesis Park staff pioneered research in southeastern Cameroon by slogging through nasty swamps, floating jungle rivers, trekking virgin rain forests and interviewing pygmy forest peoples who had never before talked to an outside explorer. From village to village informants recognized this creature (top right) from a lineup of various animals. Eyewitnesses led them to places where it had been seen, in some cases quite recently. Its actions were described in fascinating detail, including the fact that it utilizes its tail as its primary weapon. This harmonizes with paleontologist’s theories that Diplodocids could even have used their tails like a bullwhip, achieving supersonic cracks to intimidate enemies! 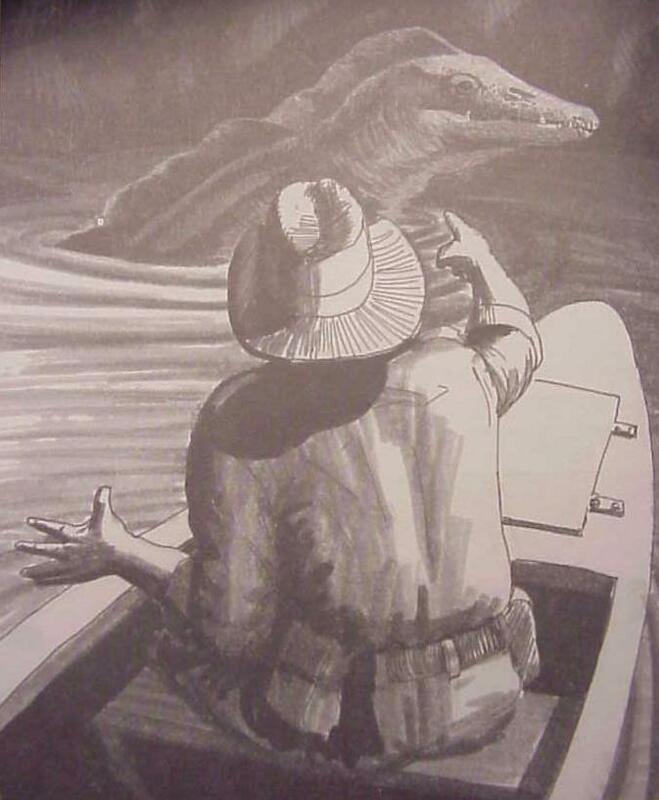 (Myhrvold, and Currie, “Supersonic Sauropods? Tail Dynamics in the Diplodocids,” Paleobiology, 1997, Vol. 23, No. 4, pp. 393-409.) For more information about the trip, see the Expeditions page. A follow up expedition was initiated by the BBC in 2001. 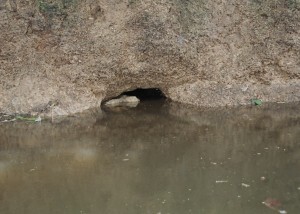 Then a trip, led by Canadians Brian Sass and Peter Beach, discovered an island in the Dja River which contained nesting caves like those identified by Mackal. They took casts of footprints and photographs of the caves (bottom right) and actually had a brief encounter with the elusive monster of Cameroon as it swam past their dugout canoe toward its lair. Such “burrow digging” activity on the part of dinosaurs was confirmed by fossils in 2008. 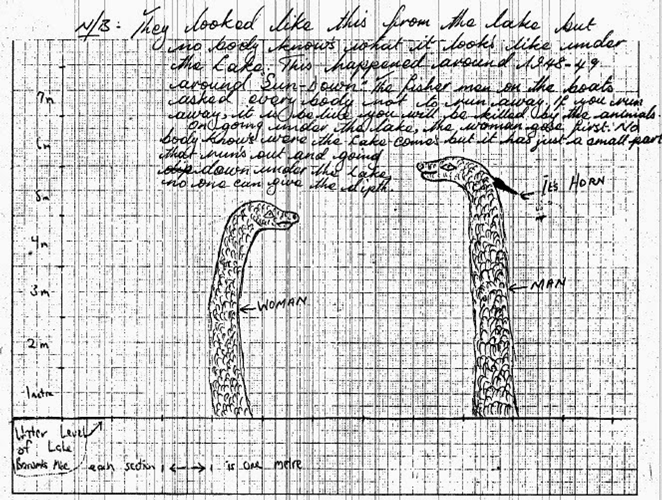 A paleontologist from Montana State University stumbled upon a sandstone mass that was “S-shaped” and about 7 feet long. At the end of this feature were the bones of an adult dinosaur and two juveniles who apparently inhabited a burrow which filled with an influx of sand, trapping the inhabitants. This burrow, which is surrounded by rock derived from mud and clay, is strong evidence that digging and denning dinosaurs cared for their young. The scenario matches quite precisely the reports from Cameroon!